What do you think? Is today more of a Deathly Hallows kind of day, or is today a bit more like a lightning-shaped scar day? Maybe you're feeling in the mood for a train ride today. Yes, it's definitely a 9 3/4 platform sort of day. Wait. Perhaps today is a little more somber and you need some of Severus Snape's strength to carry you through it... always. Well, whatever kind of mood you're feeling, you can have the right pair of earrings to match it when you get this Harry Potter 5-pack set of earrings. This pack comes with 5 distinct pairs of earrings for Harry Potter fans. Each one is an iconic nod to the epic novel series by J.K. Rowling. 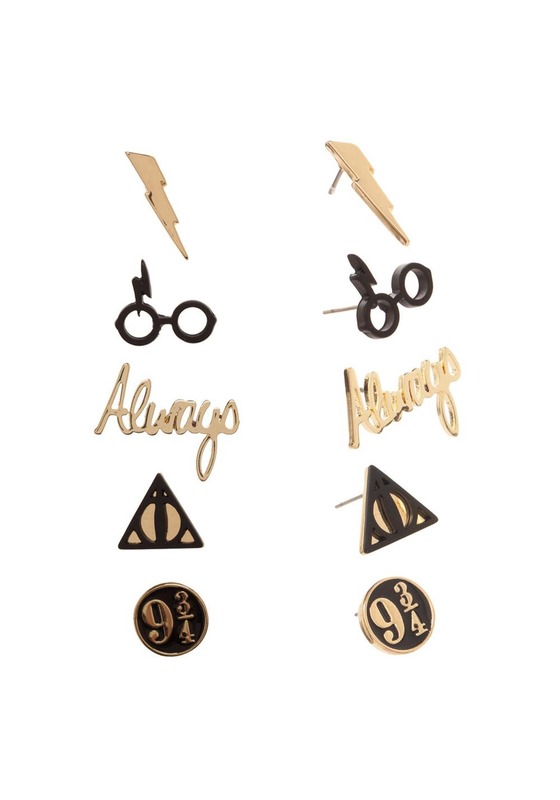 The earring designs include a gold lightning bolt, a pair of glasses with the bolt-shaped scar, the word "Always", the Deathly Hallows symbol and a 9 3/4 symbol. The earrings are all post-style and designed for pierced ears. These earrings will help any wizard get in touch with their own magical self. You can add them to your Harry Potter themed costume, but they're also a great accessory for any muggle who wants to relive some of the greatest moments from the book series.